The film’s plot is solid, but not really spectacular; the story alone isn’t enough to make the film stand out. Shinkai’s writing and direction really make the film shine, creating a visual and aural atmosphere that enriches the story. There’s a lot of visual parallelism between Hiroki in Tokyo and Sayuri, both before the time jump and while she’s in a coma; they run through the same school, see the same desk, etc. The art also accentuates certain significant scenes in the film, such as the meeting between Sayuri and Hiroki in the hospital room. In addition, the dialogue and narration written by Shinkai continues this parallelism, and in general is very deep, touching, and atmospheric. Likewise, the film’s soundtrack (composed by TENMON) does an excellent job of highlighting and accentuating the action of the plot. The combination of music, art, and plot tension make this scene amazing. On top of these, the art and music are amazing in their own right. Makoto Shinkai is a master at background illustration, and the art (especially the aforementioned backgrounds) is top-notch. Shinkai also draws the most beautiful clouds known to mankind. 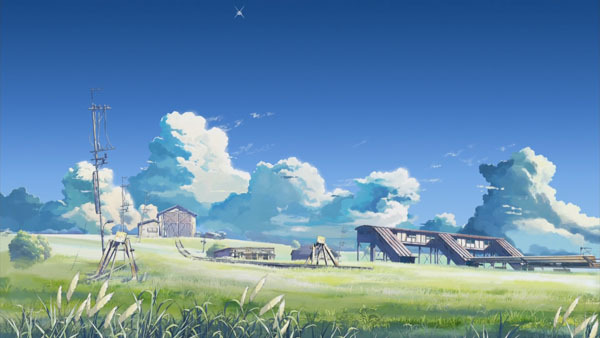 While it’s perhaps not quite as detailed or as smoothly animated as 5 Centimeters per Second, the film is still a visual masterpiece. Meanwhile, TENMON’s soundtrack for the film is amazing, conveying its own strong emotions. The only other anime music that comes close to TENMON’s is Yoko Kanno’s music (especially from Cowboy Bebop and Ghost in the Shell: Stand Alone Complex) and an unassuming song called “Ame-A” from Onegai Twins. I remember finding the soundtrack to Beyond the Clouds long before the first fansubs were released, and listening to it practically nonstop for a week. I feel like the characters are the weakest link in Beyond the Clouds. That’s not to say they’re one-sided; we get a fair amount of insight into their thoughts and feelings. However, I can’t help but notice that the quality of characterization is much lower than the quality of everything else in the film. Moreover, even though the film is plot-driven, I feel that the spirit of the film is very much character-based; like Shinkai’s other films, Beyond the Clouds is at its core a film about the distance between people. Therefore, I find it odd that the characters in Beyond the Clouds aren’t more complete. Even though I can empathize with their hardships, I don’t feel like I can fully connect with them as I can with fully fleshed-out characters in other works. On a somewhat related note, the character designs in the film are not Shinkai’s. While they are therefore more consistent than the character designs in Voices of a Distant Star, they also fit less with Shinkai’s backgrounds and scenery; there’s a pretty drastic artistic change between the characters and the backgrounds. It’s not jarring, but it is there if you’re paying close attention to the animation, and it feels a little weird. My only other complaint with the film is the use of a single shot just after Sayuri regains consciousness. 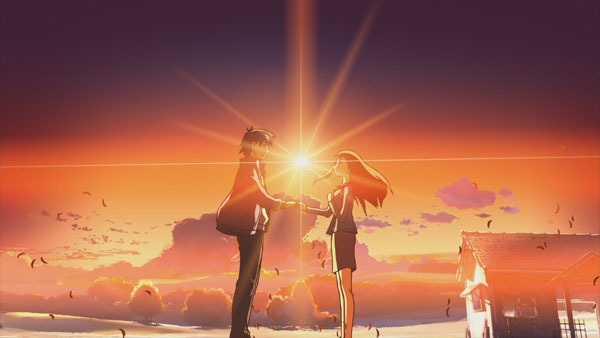 As TENMON’s beautiful theme plays and HIroki and Sayuri reunite, the tower activates and begins consuming Hokkaido. 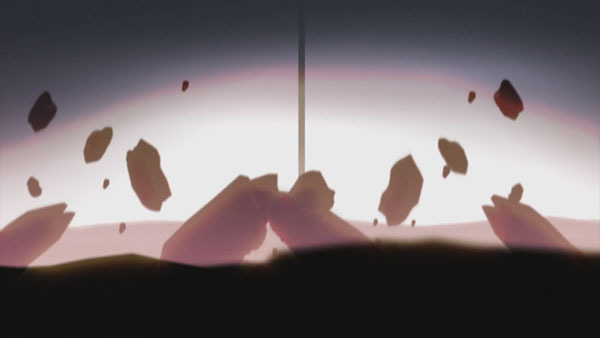 The following shot of the ground turning up and being replaced by exotic matter is appropriate from a plot perspective, but I’ve always felt like it ruins the emotional weight and impact of that scene. Its violence clashes with the catharsis of seeing Sayuri awaken and the flowing melodies of the theme; I really wish they’d left it out. This shot ruins what should be the best scene in the film. Overall, I really enjoy Beyond the Clouds. Its plot, art, and music are all amazing, and while the characters are comparatively average, they’re still totally watchable. I will go ahead and say it’s my least favorite of the three major Shinkai films so far, but that doesn’t stop it from being one of my favorite anime works. Beyond the Clouds is an amazing film, with a compelling sci-fi plot and beautiful art and music. While not spectacular, the characters are still quite interesting, and it’s easy to empathize with them. While it’s my least favorite Shinkai film to date, it’s still far above average. 10/10.